It’s hard reviewing a game that has been re-released on a new platform. The location of the home might be different, but the furnishings are the exact same. Even the yard and the dilapidated front porch have the same patches of weeds and chipped paint. Sometimes there’s a new mode, kind of like a new entertainment system, and sometimes you notice something new – was that crack in the corner of the hallway always there? – but ultimately, the experience can’t vary too much. If it’s a game you already like, then you’ll probably still like it. Tacoma was something of an indie darling well before it was released. The product of Fullbright, the studio behind the critically acclaimed Gone Home, was always going to meet a certain bar. The team behind it was just too talented to miss, and the concept was just too tantalizing. When Tacoma released, suspicions were confirmed, and Fullbright had another solid hit on its hands with another introspective, private-yet-public examination of what it means to feel something. Tacoma is, by all accounts, the same game on the PS4 as it is on PC or Xbox One. I ticked the 4K settings box in the visual options to complement my television and PS4 Pro setup, and the game looked a little sharper, its polygonal characters just a bit more vividly realized. I played through the game twice, once with its new developer commentary mode enabled, and was often left with a need to pause for a moment during a critical juncture to appreciate how much work had gone into creating it. 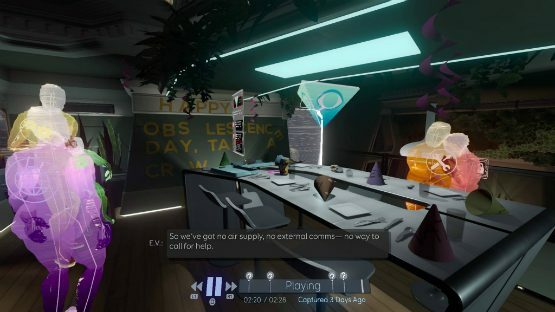 There is a beating heart at the center of the artificiality that has constructed the space station Tacoma, and it has thankfully not been lost during the game’s transplant onto a Sony console. If you’re not familiar with Tacoma, it’s a relatively short jaunt through traditional sci-fi trappings that tells a story that’s anything but what’s expected. The game succeeds in creating an atmosphere that never really feels figured out, until, of course, it is, just at the end. Prior to that, though, the space station Tacoma is equal parts a brooding, wire-filled monstrosity and an inviting, metallic home. At times, there’s a sense of inevitability and doom in one corner of a re-creation of events balanced out with Shakespeare-quoting love of life in the opposite space. For a game that is almost entirely character-driven, it’s odd that we never really get a glimpse at them as they actually are. Rather, we see them through the eyes of an AI recording, which scans them as basic 3D character models that display the occasional vital organ or brief hint of a facial feature. The characters are identified by color, and by rank, and that doesn’t stop each of them from being memorable. That’s rather the point, too. Tacoma is a game that thrives on the concept of memory and how it shapes us. Characters are driven by memory, whether it is the knowledge of a lover’s touch under the Earth’s gravitational pull made possible by past experience or the determination to succeed after a bitter failure. 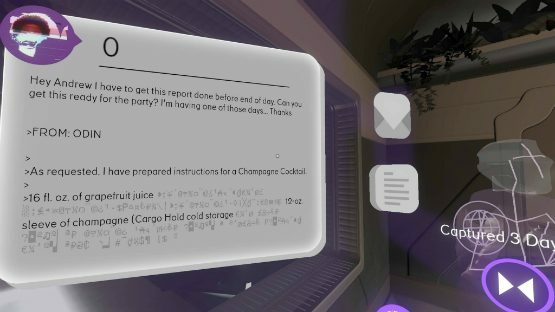 The game is ostensibly about recovering an AI from the space station, and it’s through that artificial memory that we, the protagonist, are able to piece together the mystery of what has happened on Tacoma. Everything exists in the past, but influences the present. 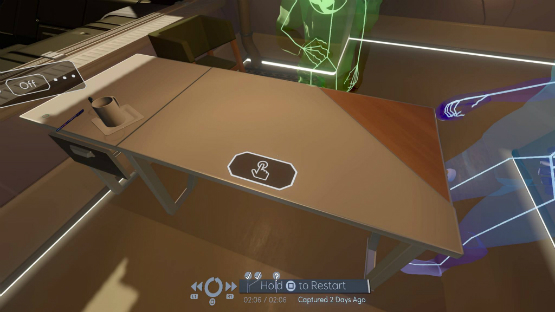 Most of Tacoma‘s gameplay is based around exploring and solving a narrative puzzle. Being able to pick up various items and examine them to find small, subtle nods to the characters whose possessions they are is a nice touch, reminiscent of older puzzle games. Make no mistake, though; Tacoma is not really a puzzle game in the sense that players are challenged to solve difficult riddles. The game moves at an almost predetermined pace, with the player being given agency to explore beyond that. We learn what we want to learn, and we delete the rest from our memory banks, unwilling to have it take up precious space. Playing Tacoma on a controller feels about as natural as it does with a mouse and keyboard, so the PS4 port ticks all the necessary boxes of being a proper success. I suppose there were a few frame drops as the elevator descended into the next section of the station, where the game is broken up into narrative arcs based around the habitational space the player has access to over the course of the story. For a game like Tacoma, it just doesn’t matter; it’s not meant to be perfect, and it never pretends to be. Tacoma‘s simple premise expands into something much larger, and it invites each of us to examine what it means to be human, and how we might pretend to be if we can’t actually achieve that. There’s a game there, underneath the questions it’s asking, and it’s a wonderful, technologically sound port. I’m not sure what else needs to be said about the achievement of Tacoma, because so many smart people have already discussed it at length when it was released on PC in 2017. All I can say is that is has aged well, attacks concepts like human will and capitalism on angles that seem fresh in 2018, and remains a must play for those willing to set aside a few hours of their time to experience some very fine, challenging work within the video game medium. Tacoma review code provided by Fullbright. Version 1.00 reviewed on a PlayStation 4 Pro. For more information on scoring please see our review policy.